Hold the Shift key, choose Edit | Advanced Preferences, and click the Export tab to open this panel. The settings on this panel control how sketches are printed and how Sketchpad objects are copied or cut onto the clipboard. 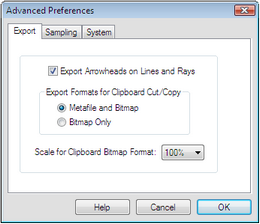 Export arrowheads on lines and rays: If this box is checked, printouts and graphics copied to the clipboard include arrowheads at the ends of lines and rays. If this box is not checked, the ends of these objects appear on printouts and on the clipboard just as they do in the sketch — with no special markings. To control whether arrowheads appear on a function plot or infinite point locus, select the object, choose Edit | Properties | Plot, and check or uncheck the checkbox to show arrowheads. Export format for clipboard cut/copy: Sketchpad can export a graphic image of your sketch using a vector format (which records information about how to draw objects like segments, circles, and captions) or using a bitmap format (which records the pixels that appear on the screen). Sketchpad normally puts both formats on the clipboard, leaving the decision to the program into which you are pasting. You can choose Bitmap only if special circumstances require it. The vector format produces a smoother and more accurate image, and is usually the preferred format for word processors, graphics programs, and layout programs. On Windows, the vector format is EMF+ (Enhanced Metafile Format); on Macintosh it's PDF. Scale for clipboard bitmap format: This value determines the magnification used for clipboard bitmaps; use it to reduce the stair-step effect (called aliasing) that occurs with bitmaps. Set this to more magnification if you’re copying pictures from Sketchpad to paste into a document in a word processor or page layout program that you intend to use for high-quality production. If you set the scale to more than 100%, the pasted picture will be large, and you’ll need to scale it down in the word processing or page layout application into which you paste it. The result will be a higher-quality printout from the other application.